Flowers and weddings go hand in hand. From floral centerpieces to luxurious bouquets, flowers are a beautiful way to make a stunning statement during your wedding day. But let’s not forget the guys! Grooms and groomsmen can also don a little piece of floral elegance in the form of boutonnieres. So I thought it would be fun to share more about these small accents, from what they are and why men wear them. But most importantly, to give you some fun inspiration to as you pick the perfect boutonniere for the men in your life! So, what are these little flowers? Boutonniere’s consist of one or two focal flowers with greenery to compliment it. Some believe they go way back to the Medieval period. Traditionally, they were worn by knights in battle as a token given to them by their female admirers back home. 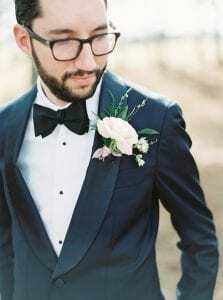 Today, boutonniere’s are worn as a symbol of the groom and groomsmen ties to the bride and her bridesmaids. How sweet! Boutonnieres aren’t limited to the groom and groomsmen only. They can be worn by fathers, grandfathers, uncles, cousins, or anyone else you might want to honor. 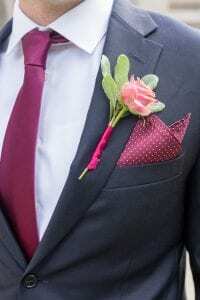 Other boutonnieres can be made to be smaller, however, the groom and groomsmen’s should be most prominent. They are made to be worn on the left jacket lapel, or on the left side of the chest, right next to the heart. As you might suspect, there are traditional styles and there are some more spunky and creative trends, so feel free to mix it up! Boutonnieres usually have coordinating colors that match the bridesmaids’ dresses as a means to connect the bridal party. However, they can also include lace ribbons, extra greenery, or any other special addition you might think of. So keep it traditional or abandon all tradition and pin something that reflects you and your significant other! Think creatively and be careful not to poke those groomsmen while you are pinning! Want more help with the small details? Contact Magnificent Moments Weddings today! We would love to help make your wedding great come true!